When I first walked into Canterbury Bowling Club I thought I was in the wrong place. I couldn't see where the performance would be held and the venue was filled with locals having a relaxed Friday night. Upon closer inspection I discovered the room where I was meant to go was set up like a school trivia night, or in this case, a spelling bee. They always say not to judge a book by its cover but I've never been able to live by that rule, so my bookcase is donned with beautiful looking books. By this stage I really wasn't sure what to expect with the performance that lay ahead and I thought it might feel like an amateur school play. Boy, was I wrong. Put together by the Canterbury Theatre Guild, The 25th Annual Putnam County Spelling Bee was an elaborate production that completely threw me by surprise. The story told of an annual county spelling bee that housed eccentric characters, both in the child contestants and in the adults involved. Generally I'm not a fan of musicals but the songs seemed to flow and their lyrics had the audience rolling in the aisles. I must admit I was hugely impressed with the quality of the singers. Their voices were sensational and they sounded like they should have been in a Disney movie, but not as G-rated; one of my favourite songs was about an erection. The songs went for a little too long sometimes and I thought they could have been more effective if slightly shorter but still, incredibly entertaining nonetheless. 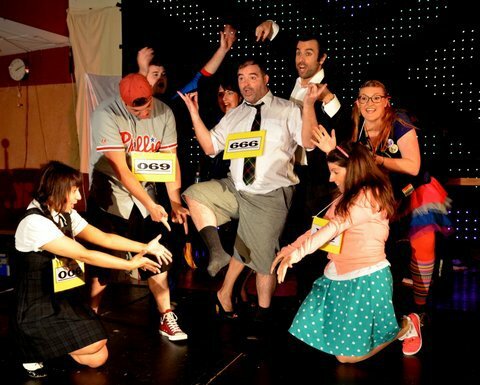 The 25th Annual Putnam County Spelling Bee was a fun experience. One that I really didn't expect but that I would definitely recommend. A big effort was put into the production of this play with its flashing lights and band ensemble; I love that it felt like a Broadway production in a local bowling club.